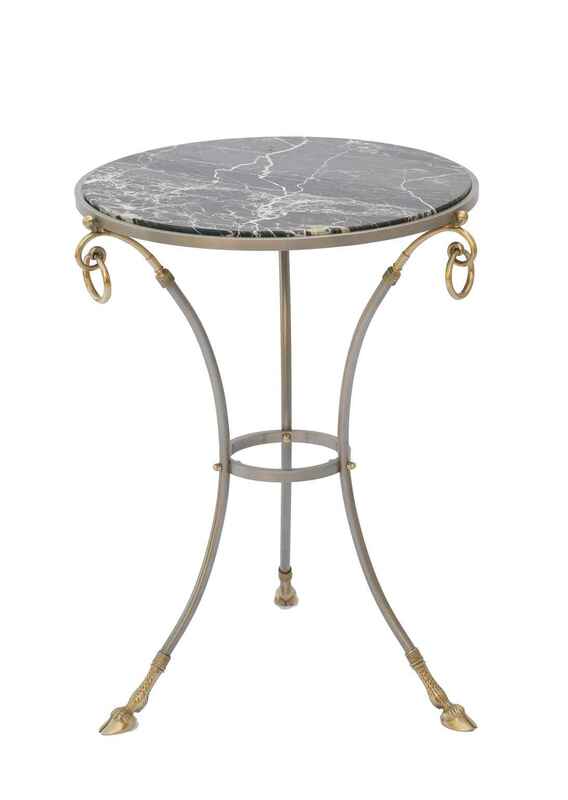 Gueridon style occasional end table, in the manner of Maison Jansen, having a round top of black marble, on a frame of polished steel, its triple-splayed legs are headed with brass scrolls and rings, and joined by a circular stretcher, ending in cloven hoofed feet. Gueridon style occasional end table, in the manner of Maison Jansen, having a round top of black marble, on a frame of polished steel, its triple-splayed legs are headed with brass scrolls and rings, and joined by a circular stretcher, ending in cloven hoofed feet. CONDITION: Excellent condition. Minor wear consistent with age and use.